Considering the functions of melatonin, it seems reasonable to speculate that melatonin may be relevant in the protection of periodontal tissue from the effects of free radicals. Thus, to determine the relationship between salivary melatonin level and severity of periodontal disease and to measure the salivary melatonin level in health and periodontal disease, this study was carried out in the Department of Periodontics, Rural Dental College, Loni. This study reviews the considerable data available relating to ROS activity and antioxidant defence in terms of salivary melatonin levels to inflammatory diseases and attempts to draw parallels with periodontitis in an effort to stimulate more periodontal research in this important area. To evaluate the melatonin levels in the saliva in periodontal health and disease. To evaluate and compare the relationship between salivary melatonin level and periodontal condition among the various groups under study. To evaluate and compare the relationship between salivary melatonin level and attachment loss among the various groups under study. To evaluate and compare the relationship between salivary melatonin level and gingival inflammation among the various groups under study. The subjects of age 18 years and above were selected from the out patient department of the Department of Periodontics, Rural Dental College and Hospital, Loni. After obtaining an informed consent, a total of 20 patients with healthy periodontium and 20 patients each with mild, moderate, and severe periodontitis were enrolled in the study. Subjects with a history of a systemic neurological disorder (e.g., epilepsy or schizophrenia), disease with possible effects on the immune system, or medication that might alter melatonin levels were excluded from the study. We assessed all the individuals for gingival inflammation using the Gingival Index (Loe and Silness 1963), periodontal disease severity by the Periodontal Disease Index (Ramfjord 1959), and attachment loss with the William's graduated probe. Chronic periodontitis is categorized as mild or slight, moderate, and severe periodontitis on the basis of attachment loss. Saliva was collected using the BUHLMANN Saliva Collection Device. Cotton swab in the device was kept in the subject's mouth below the tongue. Each of these cotton swabs can absorb up to 3 ml of saliva. The procedure calls for 0.2 ml of saliva for duplicate determinations. The cotton swab was immediately transferred to the centrifuge. The clear saliva was collected in the lower chamber of the saliva collection device. The collected sample was then transferred for analysis, which was done immediately after the collection. The saliva samples absorbed in the cotton swab can be stored in the saliva collection device for up to 7 days at 2-8°C. The BUHLMANN Direct Saliva Melatonin ELISA is a competitive immunoassay using a capture antibody (Ab) technique. The polyclonal Kennaway G280 anti-melatonin antibody has been coated onto the microtiter plate provided in the kit. After the first 16-20 h of overnight incubation, melatonin present in the pre-treated saliva, controls, and calibrators, respectively, compete with biotinylated melatonin during the second 3-h incubation for the binding sites of this highly specific Ab. After washing, the enzyme label, streptavidin conjugated to horseradish peroxidase (HRP), is added, which binds during a third 60-min incubation step to the melatonin-biotin-Ab complexes captured on the coated wells. Unbound enzyme label is then removed by a second washing step and tetramethylbenzidine (TMB) substrate is added to the wells. In a fourth 30-min incubation step, a chromophore is formed in inverse proportion to the amount of melatonin present in the sample. The color turns from blue to yellow after the addition of an acidic stop solution and can be measured at 450 nm. The values are expressed as mean ± SD. Statistical comparisons were performed using Student's t-test. [Table 1] shows a comparison of the values of the clinical parameters and salivary melatonin level between the control and the mild periodontitis groups. 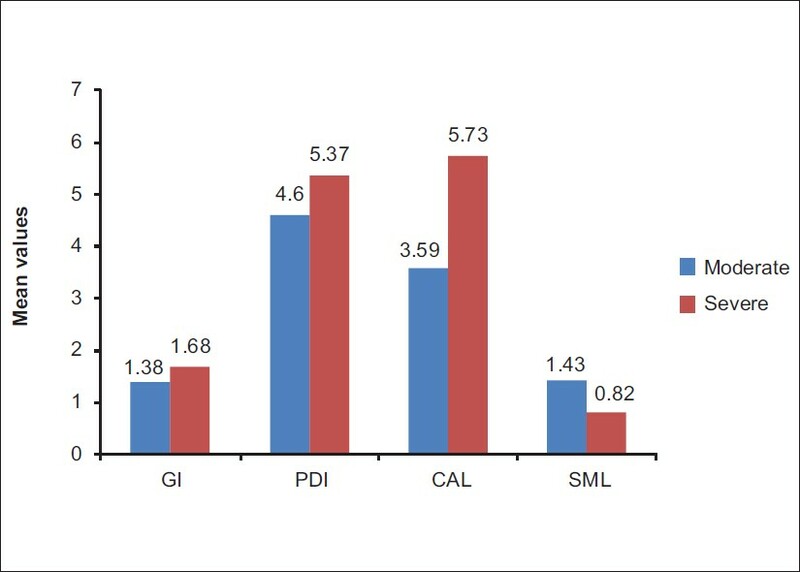 We observed significantly high values of Gingival Index (GI) (1.27 ± 0.4), Periodontal Disease Index (PDI) (3.65 ± 0.52), and Clinical attachment loss (CAL) (1.79 ± 0.22) in the mild periodontitis group. On the contrary, Salivary Melatonin level (SML) was higher (4.04 ± 0.42) in the healthy group (P < 0.001) [Figure 1]. [Table 2] shows a comparison of values of the clinical parameters and salivary melatonin level between the control and moderate periodontitis groups. There were significantly high values of GI (1.38 ± 0.21), PDI (4.6 ± 0.23), and CAL (3.59 ± 0.28) in the moderate periodontitis group and SML (4.04 ± 0.42) in the healthy group (P < 0.001) [Figure 2]. [Table 3] shows a comparison of values of the clinical parameters and salivary melatonin level between the control and severe periodontitis groups. We have noticed high SML (4.04 ± 0.42) in the healthy group (P < 0.001). 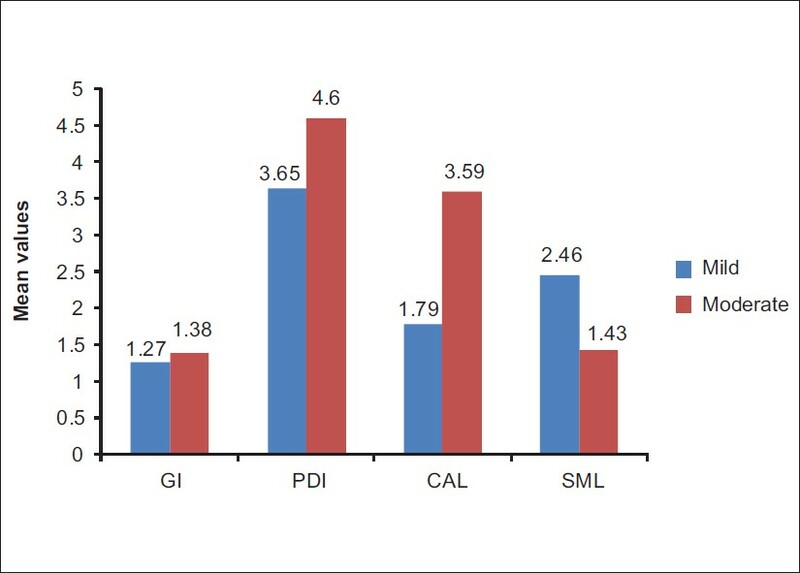 High values of GI (1.68 ± 0.27), PDI (5.37 ± 0.18), and CAL (5.73 ± 0.35) were noted in the severe periodontitis group [Figure 3]. [Table 4] shows a comparison of the values of clinical parameters and salivary melatonin level between the mild and moderate periodontitis groups. We observed a non-significant difference in the values of GI in both the group (P > 0.05). 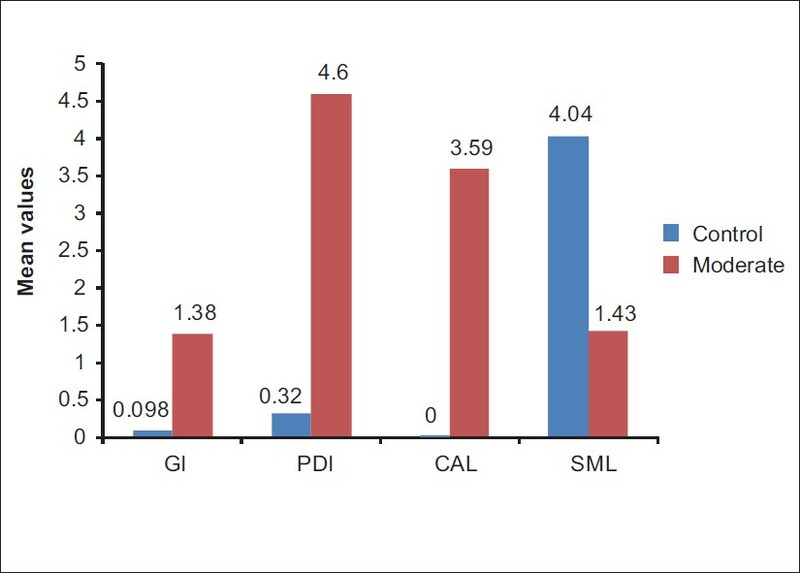 There were significantly high values of PDI (4.6 ± 0.23) and CAL (3.59 ± 0.28) in the moderate periodontitis group. On the contrary, SML was higher (2.46 ± 0.55) in the mild periodontitis group (P < 0.001) [Figure 4]. [Table 5] shows a comparison of values of clinical parameters and salivary melatonin level between the mild and severe periodontitis groups. 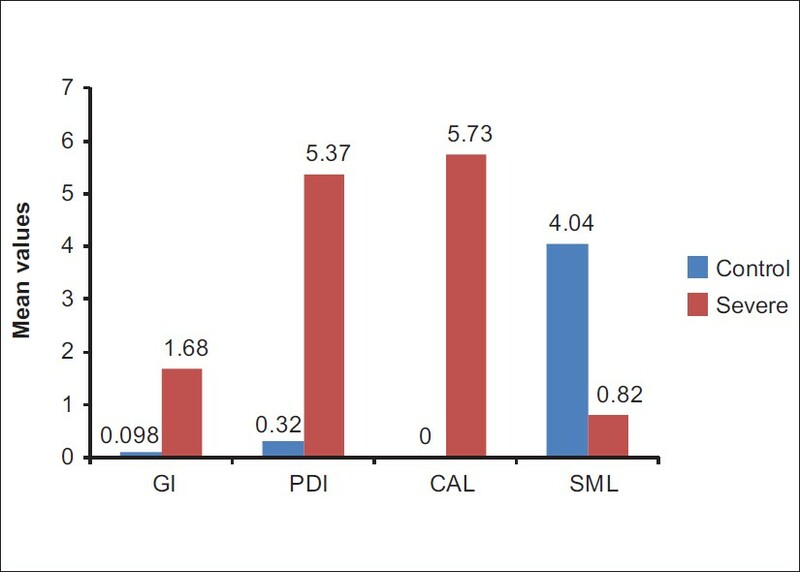 We observed significantly high values of GI (1.68 ± 0.27), PDI (5.37 ± 0.18), and CAL (5.73 ± 0.35) in the severe periodontitis group, but SML was higher (2.46 ± 0.55) in the mild periodontitis group (P < 0.001) [Figure 5]. [Table 6] shows a comparison of values of clinical parameters and salivary melatonin level between the moderate and severe periodontitis groups. 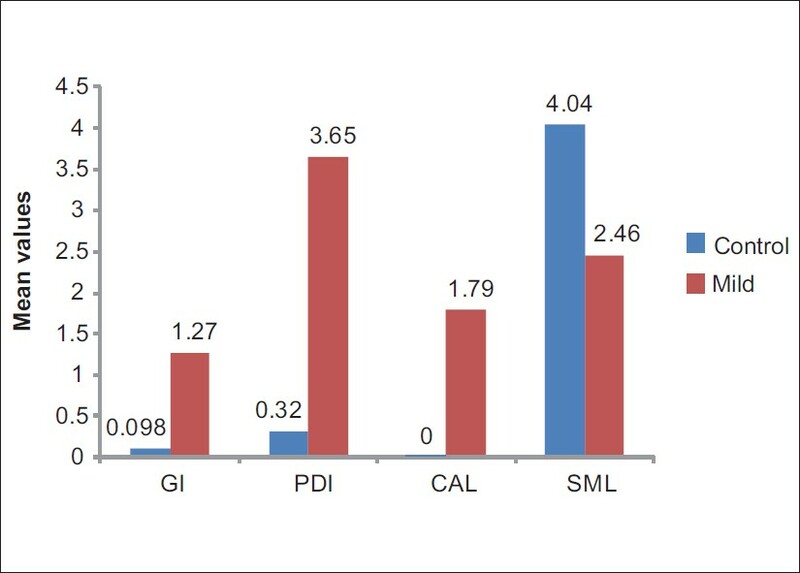 We observed significantly high values of GI (1.68 ± 0.27), PDI (5.37 ± 0.18), and CAL (5.73 ± 0.35) in the severe periodontitis group relative to the values obtained in the moderate periodontitis group. Again, SML was higher (1.43 ± 0.2) in the moderate periodontitis group (P < 0.001) [Figure 6]. Considering the above-mentioned functions of melatonin and its role in various chronic diseases, including periodontal disease, we tried to evaluate and compare the levels of melatonin in saliva in healthy and adult periodontitis patients. GI was considered as the indicator of inflammatory condition of the gingiva throughout the oral cavity. Periodontal disease and CAL were taken into consideration to assess the connective tissue destruction and bone loss. Periodontal disease index gave an idea of the overall periodontal tissue destruction and CAL was used to calculate the total periodontal destruction. We observed that salivary melatonin level in all the three disease groups: mild, moderate, and severe, was 2.46 ± 0.55, 1.43 ± 0.2, and 0.82 ± 0.18, respectively, while it was 4.04 ± 0.42 in the control group. When compared among all four groups, salivary melatonin level decreased significantly from the control to the severe periodontitis group (P-value < 0.001). We consistently found significantly high values of other clinical parameters like GI, PDI, and CAL in the more advanced disease group. 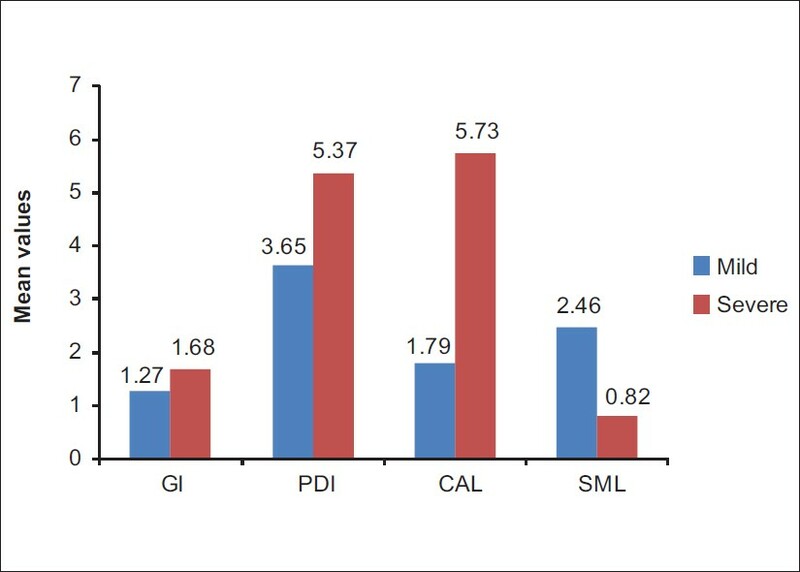 Data from our study indicated that the salivary melatonin level varied according to the severity of the periodontal disease; when the GI, PDI, and CAL scores were higher, the salivary melatonin level was low. This suggests that melatonin may possess the ability to fight against infection and inflammation. This finding is similar to the results of the study by Antonio Cutando et al., where they found a decrease in the salivary melatonin levels as the severity of the periodontal disease increased, indicating that melatonin may act to protect the body from external bacterial insults. Reiter  mentioned that melatonin is the only antioxidant known to wane with age. Thus, after middle age, circulating levels of melatonin gradually diminish in all species, which contrast with other antioxidants. Battino et al. observed a decrease in the salivary/serum melatonin ratio with higher age and concluded that melatonin levels in the oral cavity were reduced by a lower clearance of serum melatonin by the salivary glands. In our study, 95% of the patients with moderate and severe periodontitis were aging 40 years and above, which justifies the above finding. Conclusively, it could be stated from this study that there is a negative association between the salivary melatonin levels and periodontal disease severity. Consequently, the reduction in the saliva production with higher age and the decreased melatonin production in older adults, reflected in low salivary melatonin levels, predispose these individuals to an increased risk of developing oral and periodontal disease. 1. Chapple IL. Reactive Oxygen Species and Antioxidants in Inflammatory Diseases. J Clin Periodontal 1997;24:287-96. 2. Battino M, Bullon P, Wilson M, Newman H. Oxidative Injury and Inflammatory Periodontal Diseases. The Challenge of Antioxidants to Free Radicals and Reactive Oxygen Species. Crit Rev Oral Biol Med 1999;10:458-76. 3. Halliwell B. Free Radicals, Antioxidants and Human Disease: Curiosity, Cause or Consequence? Lancet 1994;344:721-4. 4. Cutando A, Galindo P, Gómez-Moreno G, Arana C, Bolaños J, Acuña-Castroviejo D, et al. Relationship between Salivary Melatonin and Severity of Periodontal Disease. J Periodontal 2006;77:1533-8. 5. Cutando A, Arana C, Gómez-Moreno G, Escames G, López A, Ferrera MJ, et al. Local Application of Melatonin Into Alveolar Sockets Of Beagle Dogs Reduces Tooth Removal-Induced Oxidative Stress. J Periodontal 2007;78:576-83. 6. Russel RJ. Reiter Melatonin Lowering the High Price of Free Radicals. News Physiol Sci 2000;15:246-50. 7. Reiter RJ, Tan DX, Gitto E, Sainz RM, Mayo JC, Leon J, et al. Pharmacological Utility of Melatonin In Reducing Oxidative Cellular And Molecular Damage. Pol J Pharmacol 2004;56:159-70. 8. Reiter RJ, Tan DX, Mayo JC, Sainz RM, Leon J, Czarnocki Z. Melatonin as an Antioxidants: Biochemical Mechanisms and Pathophysological Implications in Humans. Acta Biochimica Polonica 2003;50:1129-46. 9. Chapple IL, Brock G, Eftimiadi C, Matthews JB. Glutathione in Gingival Crevicular Fluid and Its Relation to Local Antioxidant Capacity in Periodontal Health and Disease. Mol Pathol 2002;55:367-73. 10. Chapple IL. Role of Free Radicals and Antioxidants in the Pathogenesis of the Inflammatory Periodontal Diseases. Clin Mol Pathol 1996;49:M247-55. 11. Fitzpatrik A. Melatonin in Health and Disease. Alternative and Complementary Therapies, Dec 2006 282-291. 12. Reiter RJ, Tan DX, Terron MP, Flores LJ, Czarnocki Z. Melatonin and Its Metabolites. New Findings Regarding Their Production and Their Radical Scavenging Actions. Acta Biochim Pol 2007;54:1-9.